4716 Skytrail, Yukon, OK.| MLS# 852911 | Oklahoma City Real Estate | Apple Realty, Inc. Pride in ownership says it all! This beautiful, well cared for home comes complete with updates throughout, inground pool, shop, RV parking & circular drive. 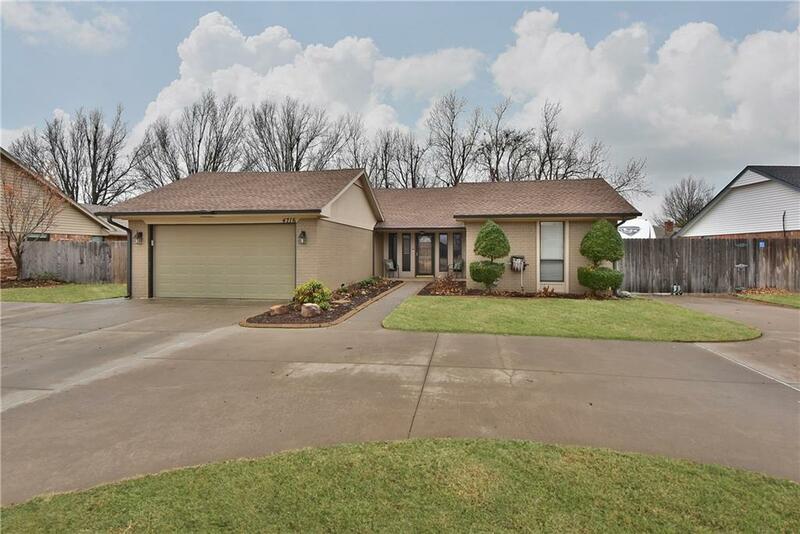 The remodeled entry has solid oak door & matching plantation shutters & welcomes you into the large living room that has a vaulted ceiling, Pergo wood flooring laminate, gas fireplace with blowers & gas starter. Kitchen was remodeled with new granite, stainless steel appliances, cabinets, backsplash, sink, faucet, pantry & LED lighting. Bathrooms have also been completely updated. Newer flooring throughout except in bedrooms & seller is giving a $1,500 allowance for replacement of carpet. The shop is insulated & air-conditioned. Amazing reinforced concrete drive, 8" thick with 5/8" rebar every sq ft to withhold 70,000 lbs of weight. 2015 Roof has new decking, ventilation turbines, guttering & Class 4 impact resistant roof with 50 yr warranty. RV parking, dump station, 30amp brkr hookup. Realtor related to seller. And much more!